A ‘sequel-of-sorts’ to Ibsen’s groundbreaking play, this new work is capably interpreted but fundamentally lacking in subtlety and complexity. This Broadway hit asks the tantalising question: “What happened after Nora walked out on her family in Henrik Ibsen’s A Doll’s House?” Described as ‘a sequel-of-sorts’, Lucas Hnath’s A Doll’s House, Part 2 picks up the story 15 years later, further exploring ideas about feminism, marriage, individuality, responsibility and morality that shocked late 19th century audiences. Fiercely tackled by this new play’s four characters, these conflicting ideas provoke questions about how far we’ve come in the early 21st century, and also generate narrative tension. 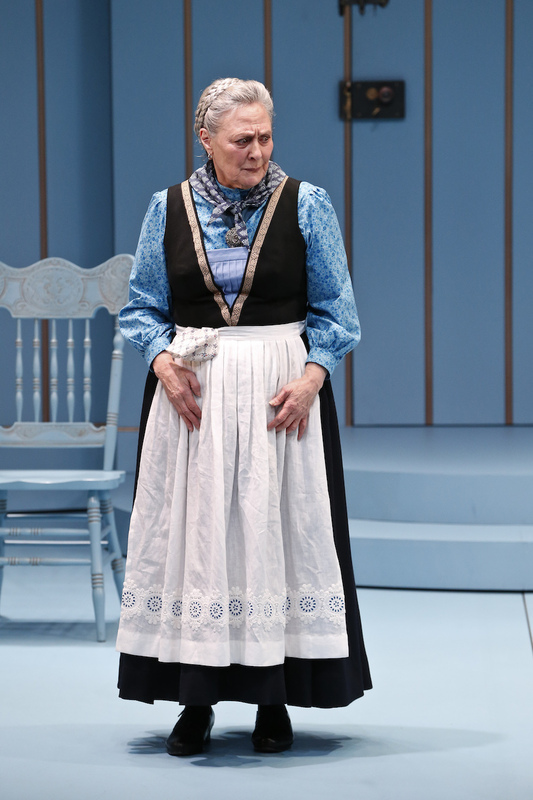 Fundamentally, however, it’s a play short on subtlety and complexity, which suggests its success is at least partly based on audiences’ enduring fascination with Ibsen’s groundbreaking original. Hnath’s Nora returns through the door she boldly walked out of 15 years before, having never made contact in the interim. She has prospered as an author of feminist novels and, believing that her husband, Torvald, filed for divorce, has conducted her life, from relationships to legal contracts, as a single woman. The revelation that he never did will likely lead to her ruin, so she has returned to resolve the matter. Nora encounters Anne Marie, nanny to both Nora and Nora’s children, and loyal servant of Torvald, who is stunned by his wife’s return. Their daughter, Emmy, now a young woman, reveals how he coped with his wife’s sudden exit, adding further legal, social and personal complexity to the situation. 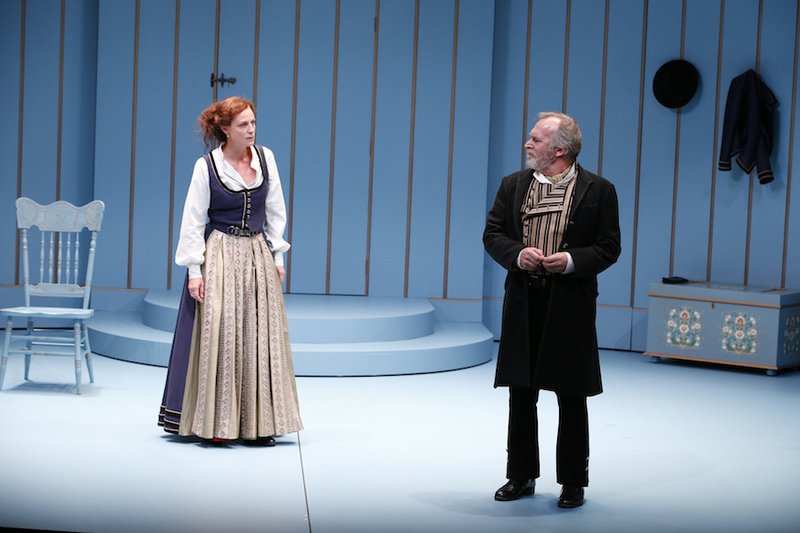 A Doll’s House, Part 2 has a foot in both Ibsen’s late 19th century Norway and our contemporary world. 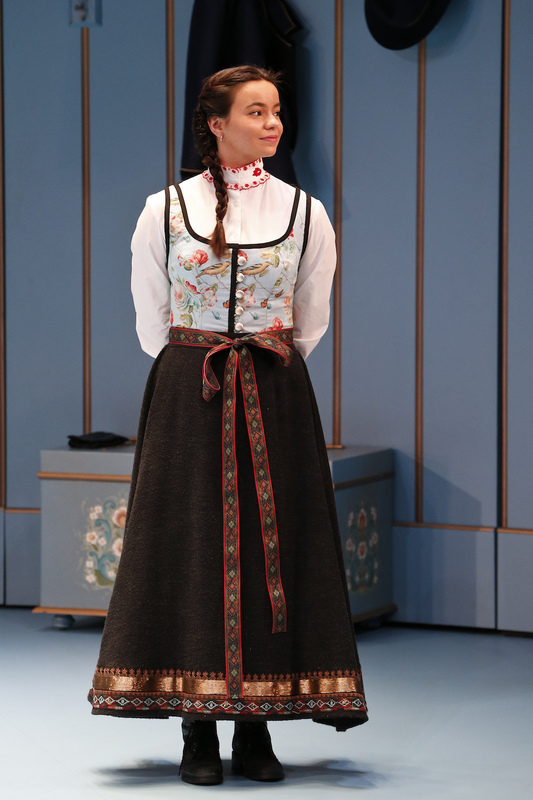 The script is loaded with modern speech, including several expletives and, just as the American performances were presented with local accents, for this MTC production the cast use neutral Australian accents. Set and costume designer Tracy Grant Lord conjures a traditional Scandinavian look, including the sparse one-room set of powder-blue wooden walls and furniture. 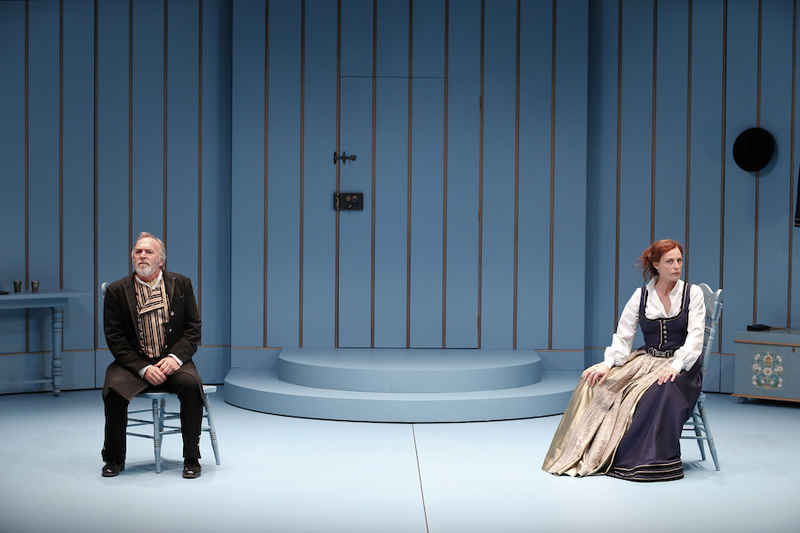 Above it is a digital screen on which the audience initially sees themselves – unsubtle hint: it’s about us – before Nora is shown, looking down onto the set as if into a doll’s house. The screen is also used to boldly display the name of the character who is central to each scene. This is overkill, not just because the audience is intelligent enough to know who’s who in a four-hander, but also because the script is very clear, arguably too clear, about what’s going on. The characters tell us exactly what has happened and are fairly direct about what’s going through their minds. The intrigue is in how the predicament Nora and Torvald in particular find themselves in will be resolved, and how they will feel about each other at the end. Nora’s progressive ideas about relationships and women’s rights, and her fiery exchanges with Torvald about them, also tug at the mind. Are we that much better at making relationships work in the early 21st century? How far have we really come regarding equality of the sexes? Will Nora’s ideals ever be possible? It’s very far from shocking the audience as Ibsen’s play did, however. Under the direction of Sarah Goodes, the cast make the most of what they have to work with. Marta Dusseldorp’s Nora is assertive, right down to sitting with legs boldly parted under her long skirt, and physically lunging to emphasise her points (though so often it becomes mildly distracting). She delivers welcome flashes of subtlety when her character is flustered or deeply honest. Greg Stone elicits sympathy as Torvald: slightly curled in on himself, but erect when expressing his pain, he shows much more feeling than in Ibsen’s version. Zoe Terakes is ramrod straight as Emmy, and even more direct than the character she clearly takes after. 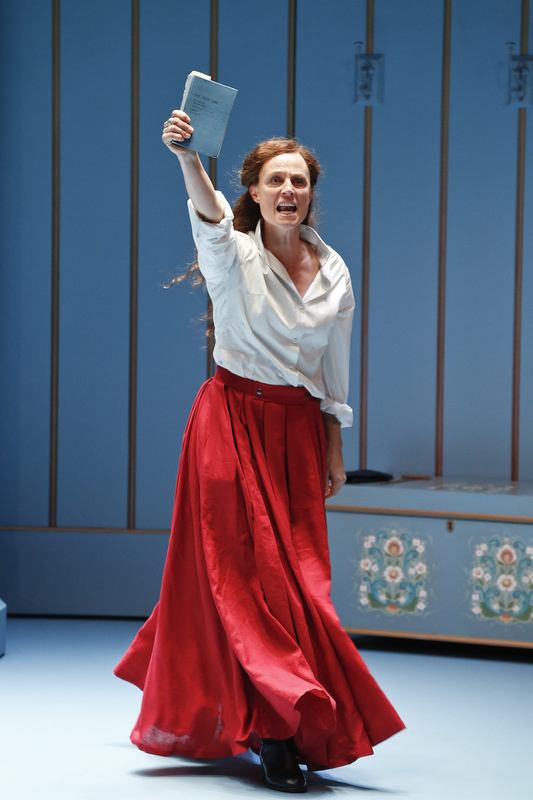 Deidre Rubenstein limps about as the old servant, Anne Marie, expressing anxiety physically and vocally, both through tone and words (including those unexpected expletives, though they quickly lose their shock value and humour). She also lets us glimpse a strong core of selfless devotion, which is rooted in a poor woman’s lifelong lack of choices. If A Doll’s House, Part 2 wasn’t ‘a sequel-of-sorts’ to a seminal work, it would likely fail to excite as an exploration of how we think about relationships and feminism today. Although capably interpreted by this cast and crew, Hnath’s play ultimately underwhelms with its paucity of nuance and fresh ideas.